You know I love skincare right? So I couldn't let this opportunity pass me by. 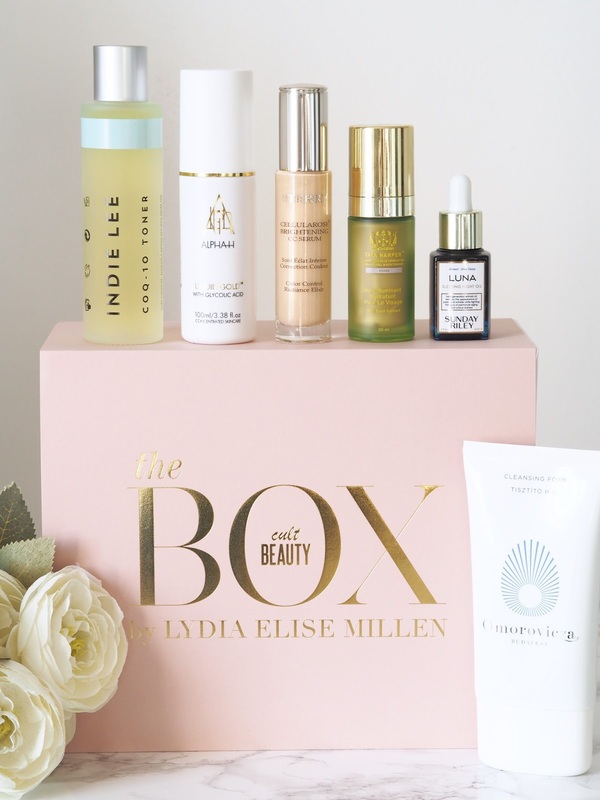 I was lucky enough to get my hands on the beauty box that Lydia created with Cult beauty. It wasn't cheap, I mean it was a bargain compared to buying all the products separately, they came to around £300, but £155 is not something you can just whip out your purse, I can't anyway! When I saw Lydia's Youtube video my immediate thoughts were "I have to have it" but I didn't just jump in. I debated long and hard about whether I should get it or not, and when release day came around it was a big YES! I made the decision based on the fact that I'd really wanted to try two of the products for a long time and those two alone came to £106 so it was a no brainer really. Now, the issue is this, the box was sold out within the hour so it's no longer available. Why blog about it then I hear you ask. Well, all the items are available individually on Cult Beauty so I thought I'd let you know my thoughts in case any of them were on your radar and you were debating whether to purchase or not. 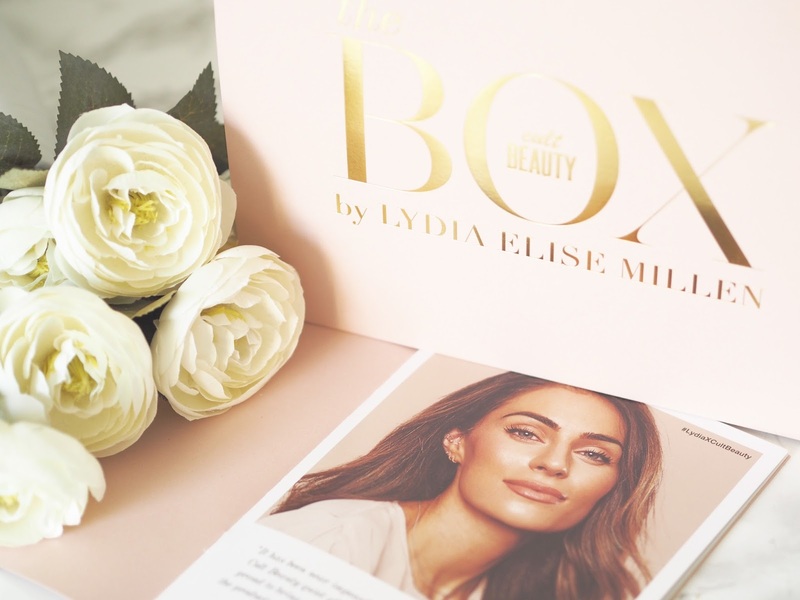 The pink packaging with the gold lettering is perfect and 'so Lydia', screaming luxury and class. 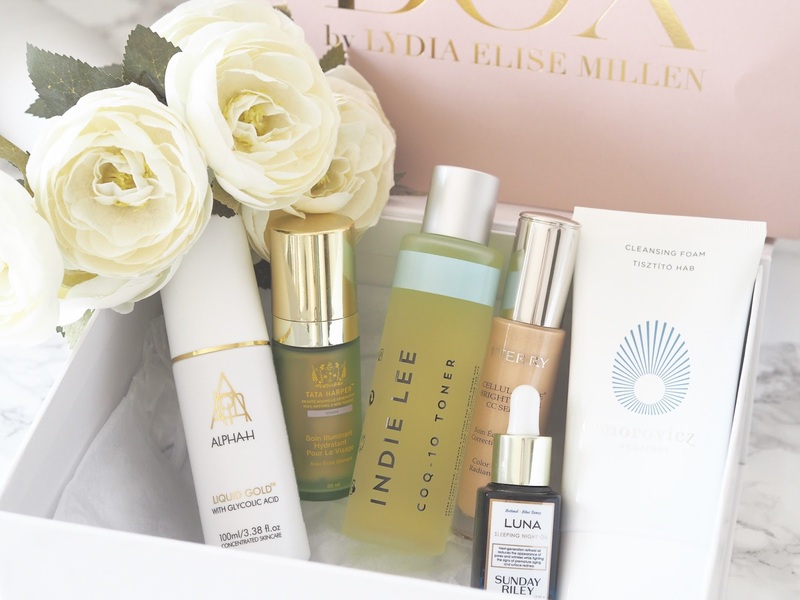 The box contains some of Lydia's favourites that she uses to achieve her glowing skin. I've been using the products for just under two weeks now and so far so good, in fact I love more or less everything. You know my skin has it's ups and downs on a regular basis, [more downs than ups] and have been suffering with bouts of hormonal spots so was a little worried these new things might trigger more. Well, let me say this, my skin has been glowing!! Seriously, I could see a difference from the first use and have been really thrilled with no spots in sight. Until now that is because as I type this I can literally feel them erupting on my chin, little blighters. I really think it's hormonal though as the spots keep coming, then they'll go again for a few days and be back with a bang bringing more mates with them!!! I'm still looking for solutions on this matter, I think it's because I'm peri menopausal or whatever it is, so do you have any tips on what can help? If so, send them my way please. Omorovicza cleansing foam. I've been using this as my second cleanse. I've got to be honest here and say this was one of the products I was worried I wouldn't use. My face has never liked water, seriously it literally feels like its shrivelling up like a prune as soon as water hits it and one of the reasons I've stayed away from foam cleaners too. This smells wonderful, almost spa like and is said to give a deep but gentle cleanse and suitable for all skin types. It's a sulphate free formula so removes makeup and impurities without stripping the skin of its moisture. Now then, I love this and I hate it. I love using it, it smells great, it cleanses beautifully, leaves my skin squeaky clean (2nd cleanse though) BUT it does leave my skin dry afterwards. My skin is dehydrated anyway so this is not good, and that's what I was worried about. Thing is I'm not sure if it's all the cleansers fault or partly to do with the fact that my face goes not get on with water! I've actually stopped using it the last few days which is a real shame. It's got so many great reviews so I'm gutted. Think I'll be passing this to Mr C.
Indie Lee CoQ-10 toner. This is beautiful, I really love this. It's not an acid toner so I use this in the morning, rather than at night, I prefer to use my acids in the evening. It's an alcohol free formula with the powerful anti-oxidant CoQ-10, helping to protect and repair the ageing effects of free radicals whilst helping to balance the skins ph to leave it smooth and soft. 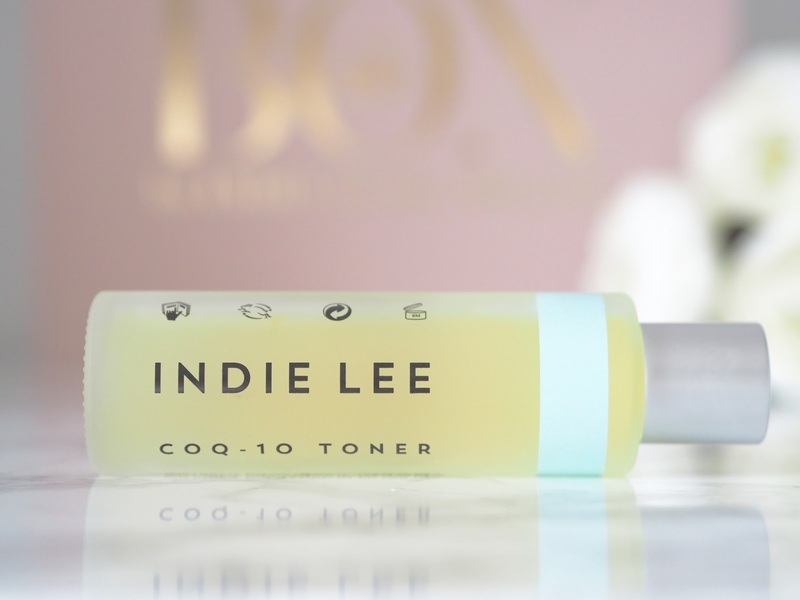 Indie Lee's ethos is based around using clean ingredients and this certainly smells clean and fresh and it really does leave my skin soft and feeling hydrated. 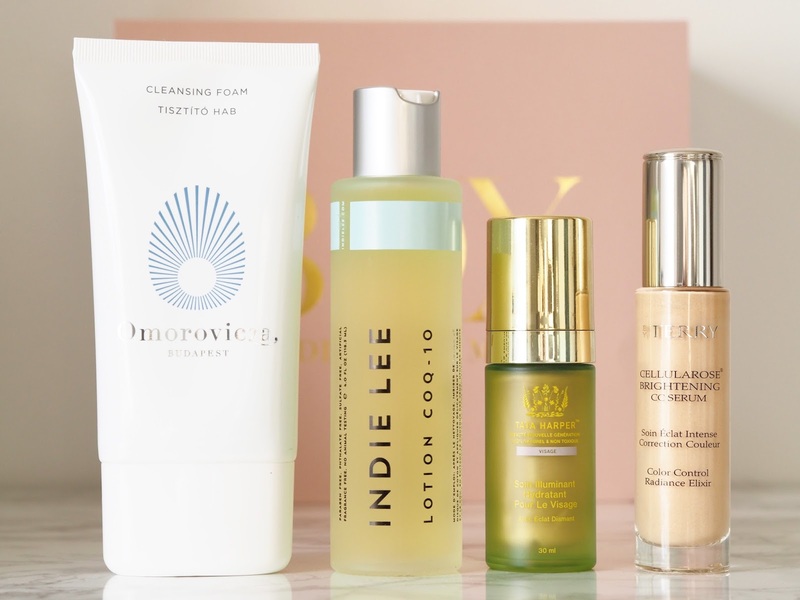 Great for most skins I would say and one I would repurchase. The only down side is that you have to be careful not to pour too much out onto the cotton pad, it comes out quickly so I can see this not lasting too long! 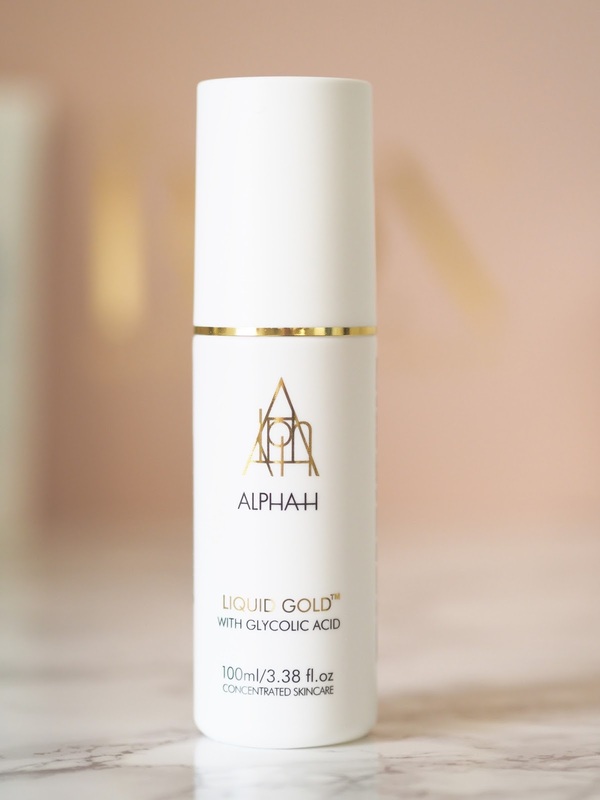 Alpha-H liquid gold. I've used this before and was excited to see it in the beauty box as one of Lydia's faves. I'm just about to run out of my glycolic acid toner from The Ordinary, (thoughts on that one here) so it was perfect timing to get this one. 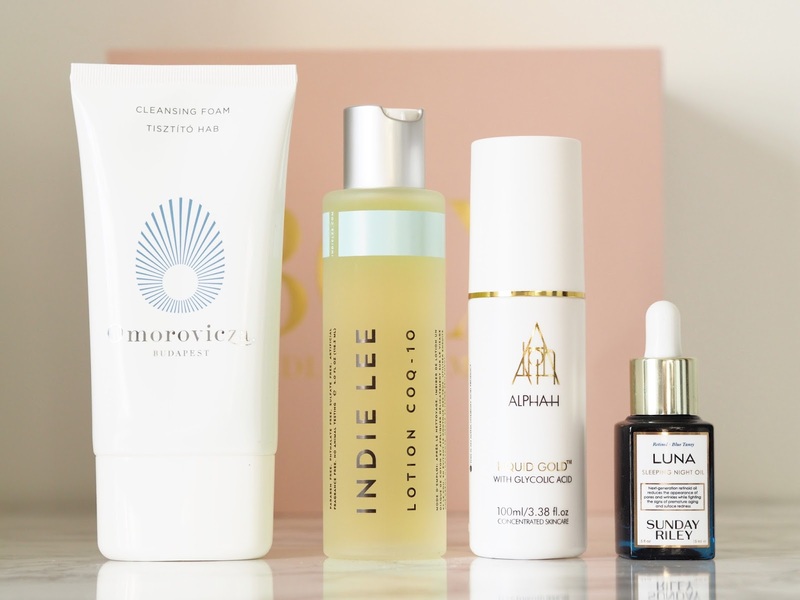 Liquid gold is a bit of cult product that helps with multiple skin issues. With 5% glycolic acid it helps to break down the 'glue' that binds the dead cells to the surface of the skin, those dead cells that make our skin look dull and lacklustre. It also helps with cell stimulation, acne scarring, brown spots, and breakouts. This is fairly strong so I would suggest building up slowly, especially if it's your first time using an acid, and then using every other night when your skin is used to it. It does give a good old tingle on application but I like that as I know it's working and the tingling sensation doesn't last long. Seeing the effect this has on my skin reminded me of how much I loved it the last time I used it and I've told myself I must NEVER be without it again. LUNA sleeping night oil. This is the product I was so excited to get my hands. I've heard so many people raving about it and about how good it is. 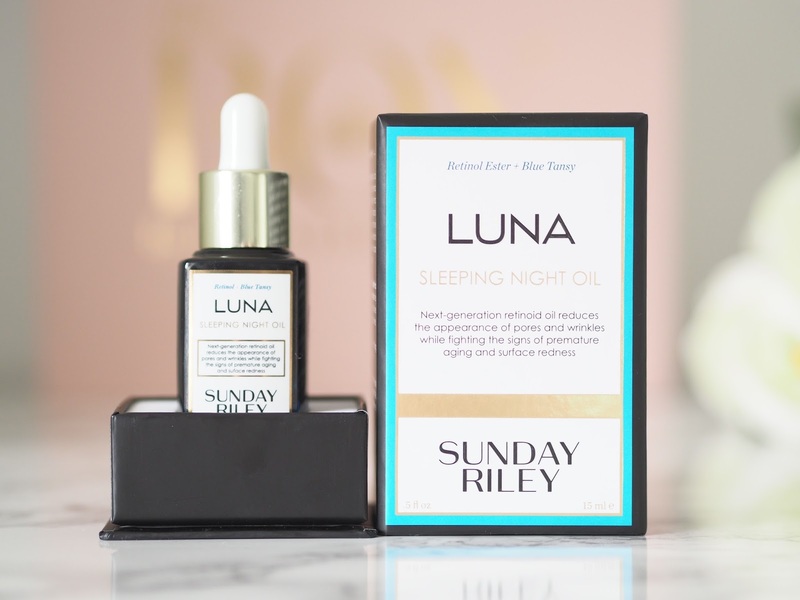 I read tonnes of reviews before I ordered the box and most are great reviews, however, there are quite a few with people saying they don't like the smell and can't use the oil because of it. It's quite a herbally smell but I love it, I really do. There are also comments about the blue dye that it used in the product too! You'll have to read the reviews about the dye and the fragrance yourself and make up your own mind. I saw results from first use. My skin was super soft and plumped the next morning and actually glowing, I really couldn't believe what my skin looked like after one use. Now my skin doesn't get on with retinol very well, [which I'm gutted about as it's the gold standard for anti-aging] even with a small amount it peels and flakes dreadfully and makes my skin look 'shrivelled', not great for an already mature face I can tell you, so I was interested to see how I would fair with this retinol. It's kind of cushioned in the oil so it's not so harsh and I get on okay with it. I have noticed though that if I get too close to my lips or nostrils the skin will start to peel, so I'm avoiding those areas now when I apply and I don't use it every night, just a couple of times a week at the moment. Most mornings I will clean my face with a wipe of micellar water on a cotton pad, I find that's enough for me, but I have used the Omorovicza cleanser a few times. I then follow with the Indie Lee toner. In my routine I also have the Skinceuticals HA intensifier and the CE Ferulic. It's all about the layering ladies! I'll finally add a moisturiser, actually no the final step is SPF. No wonder it takes me so long to get ready in the morning, I enjoy it though. Tata Harper illuminating moisturiser. Made with all natural skin boosting ingredients this moisturiser includes hyaluronic acid, shea and mango seed butters and wait for it 'Diamond Dust', although that doesn't sound very natural to me and the first thing I think is that it will be all grainy. Far from it. Let's not pretend the diamond dust has any benefit to the skin, it's there purely to help blur the fine lines and give a soft focus effect. I was worried it would be all sparkly but it isn't at all, it just leaves your skin with a lovely luminosity, a candlelit glow if you like! It sinks into the skin well without any sticky residue and you only need a small amount which is good. However, it doesn't go that extra mile for my skin which is what I want and what my dehydrated skin needs. I like it and will use it until it's finished but I can't rave about it, and won't repurchase as for the price think I would find one that will offer more. 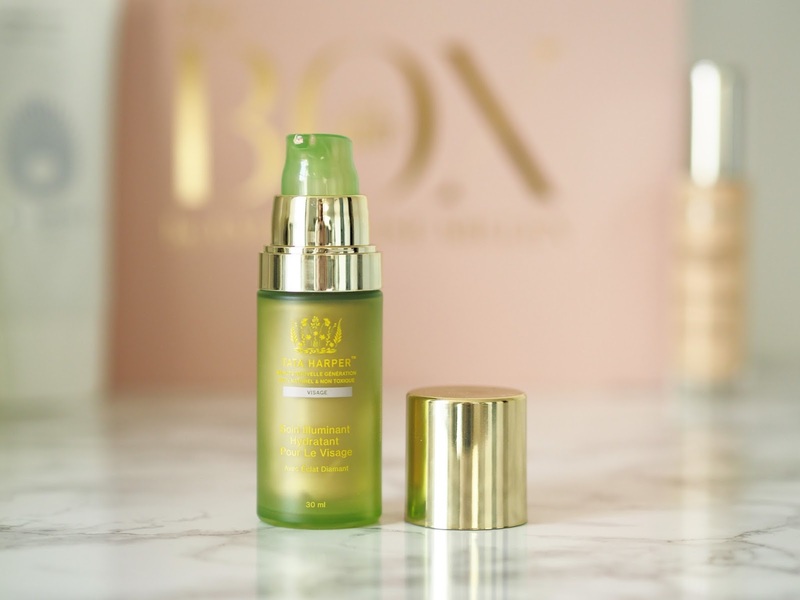 I wouldn't miss the diamond dust in the moisturiser either because I use a matte SPF on top which kind of defeats the object, and I now use the brightening serum [below] for the glow. 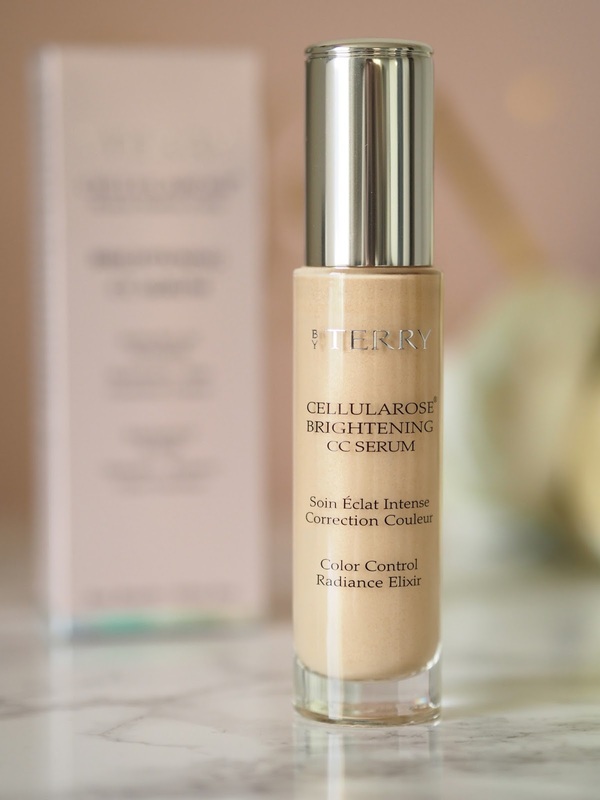 By Terry Cellularose brightening serum. Lydia has used this for such a long time and raved about it. I've wanted it ever since I saw her using it and now I have one. I got the shade apricot glow but I kind of wish I'd gone for the sunny flash shade instead. Never mind. I love it though, it's not a disappointment in any way. It's targeted towards those concerned with dull, dehydrated complexions in need of a radiance boost. It uses light reflective pearl pigments to help blur imperfections and create and even tone and radiant skin. It really does give the most beautiful glow, again without being glittery in any way and it's not heavy on the skin at all. If you're having a good skin day you can just wear this on its own to give your skin a boost, I don't have good skin days, well, not ones where I can get away with just this that's for sure, so I wear mine under my IT cosmetics CC cream or a foundation. This IS expensive but a little goes a long way so I know it will last me quite some time. I had the Caroline Hirons box that included the Indie Lee toner and loved it apart from the heavy glass bottle. I’d love to try the By Terry product as it sounds amazing! I’ve got a bottle of Alpha in the cupboard for when my Murad Retinol runs out. I love high end beauty products...shame my bank balance doesn’t agree! !